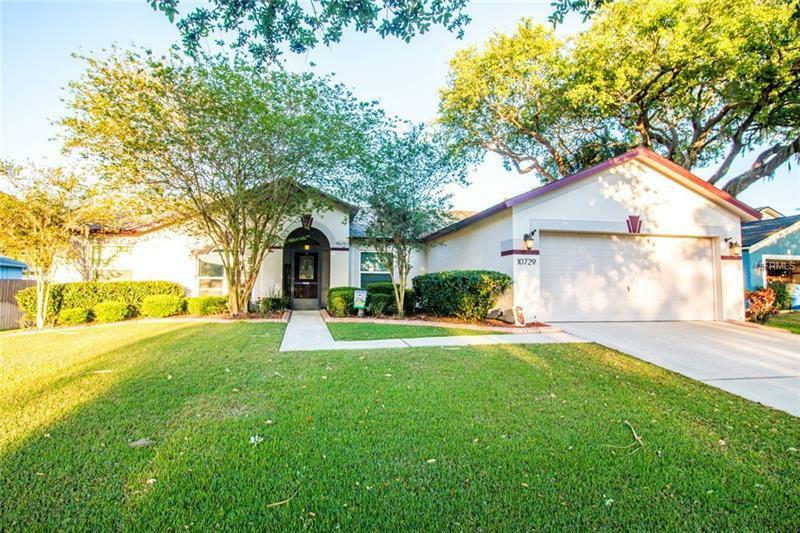 Beautiful 4 bedroom/2 bath home with large gathering room and office. Well kept home with upgraded kitchen/bathroom counters. The master bath was completely remodeled in 2017 with new shower, cabinetry and fixtures. The garage, patio and front entrance flooring have “Gorilla Garage” floors with a transferable 15 year warranty. New roof with architectural shingles and solar tube installed in 2016, New South double pane, low E windows throughout installed in 2017 and water softener. Enjoy Florida’s outdoor living in a spacious 15 x 25 screened lanai with cable hookup. Fully irrigated front and back lawn with zoysia grass and Florida friendly Queen and Bismarckia palm trees, magnolia tree, crotons and crepe myrtles. And a detached 15 x 20 out building with a work bench, electric and loads of storage. Low annual HOA fees of $30.00 and no CDD. This home is turn key!